Join the discussion on our forums! Come discuss Khadgar over in our dedicated Khadgar discussion topic. Your cards that summon minions summon twice as many. "What do you call two minions summoned at once? Twinions, haha! Wait... where are you going?" I don't believe in Power of Creation for this set, as the only 6-mana mage minions are 3-3s; which means, you're gonna have to choose the single rendom neutral 6-drop alot of the time. Conjurer's Calling however, is what makes this card potent. Slam your Mountain Giant anywhere from turn 3 an onwards. If it survives, great. If you have CC you basicly win the game. If you have Khadgar and CC, you most definetly win the game. (As long as you arent in killrange yourself). As of now, you'll have a 50% chance of getting the taunt from coinjuring your Giant, which is amazing! Does Khadgar work with Faceless Manipulator? I'm curious. The card text is, "Choose a minion, then summon a copy of it." Can someone test it out and get back to me? It says BECOME a copy so I'm sure you will only get one copy. When played against the Khadgar hero, he says, "Impostor! I am the real Khadgar!" Against the Medivh hero, he says, "I defeated you before master. I can do it again." Khadgar is going to be an absolute nightmare. That effect for 2 mana provides waaaaaaayyyyy too much combo potential. 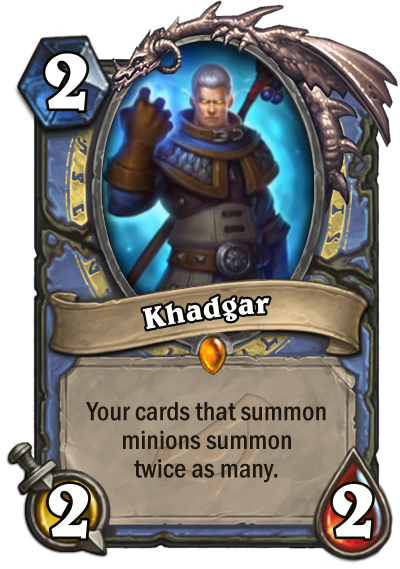 Khadgar into Power of Creation, or Turn 10 Kalecgos followed by turn 11 Khadgar + Conjurer's Calling x 2 will be a common strat, I'm willing to bet. For Wild, things get even worse: Khadgar into Marin the Fox, Khadgar into Spiteful Summoner, Khadgar into Molten Reflection, Frost Lich Jaina into Khadgar for x2 Water Elementals for every Hero Power kill, Khadgar into Barnes or Saronite Chain Gang... and of course, our old friends, the Deathrattle minions: Carnivorous Cube and Devilsaur Egg. This fucker's going to be bloody ubiquitous. Count on it. You clearly don't play wild if you think Marin the Fox and Khadgar is good on turn 10. The only one worth looking at is Khadgar and Barnes, but big priest already does that and way more in wild.